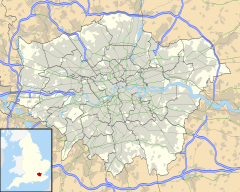 Wallington is a town in the London Borough of Sutton, England, 10.3 miles (16.6 km) south south-west of Charing Cross. Before the Municipal Borough of Beddington and Wallington merged into the London Borough of Sutton, it was part of the county of Surrey. Wallington is a post town in the SM postcode area. The town is home to three of the borough's five grammar schools. The London Borough of Sutton is a top performing borough for education in the country. 6 Famous residents and inhabitants. The name "Wallington" derives from the Anglo Saxon "Waletone", meaning "village of the Britons". Wallington appears in Domesday Book of 1086 and was held by William the Conqueror. Its domesday assets were: 11 hides. It had 2 mills worth £1 10s 0d, 11 ploughs, 8 acres (32,000 m2) of meadow. It rendered £10. The historic village was situated somewhat to the north of the current town centre around what is now Wallington Bridge over the River Wandle. At the time of the Domesday book there were two mill ponds. The mill buildings have long been demolished, but the mill pond survives as The Grange boating lake. In the 1860s one Alfred Smee, surgeon to the Bank of England, constructed an elaborate garden on the north side of the Mill Pond, and wrote an illustrated book called "My Garden" in 1872. What was then called "Carshalton" railway station was opened in 1847 in the open fields to the south of Wallington because the owner of Carshalton Park objected to it being built near to Carshalton village. This acted as a spur to the development of the area and in the 1860s Nathaniel Bridges created a prestigious housing estate of gothic revival villas (architect E. L. Brock). To provide a church for the estate, Bridges sponsored the construction of Holy Trinity, and Wallington became a separate parish in 1867. The area around Holy Trinity Church is known as Wallington Old Town. In particular Clifton Road, Belmont Road and Park Road exhibit some imposing Victorian and Edwardian villas. This southward development continued towards Woodcote and by the time of the First World War the section of Woodcote Road to the south of the station had become the new High Street. Wallington High School for Girls was established in 1888 by a collective of nuns. Wallington Methodist Church was built in 1908 on a site in Beddington Gardens in the town centre. Since 1902 the town has maintained the tradition of an annual crowning of the Wallington May Queen. The event begins with a procession through the town. Girls join the group at the age of three as "fairies", before graduating to "attendants to the May Queen" a year later. They then go on to become crown bearers before taking on the role of banner bearer. The girls then act as "princes", and become eligible to be a May Queen at the age of nine. The Municipal Borough of Beddington and Wallington was incorporated in 1936 from the former Beddington and Wallington Urban District. A town hall (architect Robert Atkinson) and public library were built in Wallington town centre in the 1930s, as was the fire station in Belmont Road. Wallington County Grammar School (for boys) was opened on London Road, close to Beddington Park in 1927. Guy Portelli's 1999 sculpture "English Lavender" in Wallington town centre. There is a large sculpture at the junction of Woodcote Road and Stafford Road representing a lavender plant. Created by sculptor, Guy Portelli, it was installed in 1999 when the new Sainsbury's store was built. The Christmas lights also represent lavender plants. One of the local lavender farmers - John Jakson of Little Woodcote Farm - lent his name to a public house in Woodcote Road. Local Scouts use lavender as the logo for the Sutton area on their shoulder badge. Many of Wallington's young men served and lost their lives in the First World War, and in 1922 a memorial was unveiled on Wallington Green by General Edmund Elles to commemorate the fallen. The memorial was altered in 1949 to include the names of the locals who died in the Second World War. The memorial is in the form of a Portland stone obelisk on a plinth, with a cross and a sunburst motif. On the sides are bronze plaques bearing the names of the fallen. It stands on blue Staffordshire engineering bricks and York stone. In 2005 it was discovered that the memorial was being attacked by moss, and English Heritage paid for its restoration. Since 2007 new retailers have opened in Wallington, including Tesco Express and Caffè Nero. These were in addition to existing retailers including Sainsbury's, Boots, W.H. Smith, Dorothy Perkins and Pizza Express, banks, estate agencies and building societies. There have been two flats developments opposite the railway station, which were completed circa 2010 and 2013 respectively. More town centre flats in Shotfield Road were completed in 2015. A farmers' market is held on the second Saturday of each month. This is usually located outside the old town hall, but occasionally in the car park at Shotfield. Sutton Community Farm, the only one of its kind in London, is located in Wallington. A not-for-profit social enterprise, it occupies a 7.5 acre small-holding of a type originally given to ex-servicemen following the First World War. There is a public library in the centre of Wallington in the "Shotfield" district; it has an outside terrace where coffee is served. Shotfield is also where the former Town Hall, and now a college, is located. In 1980 it was taken over and converted into a Crown Court. The building ceased to be a Court in April 1999, and was later converted to its current use. The town saw the opening of a small independent cinema in May 2014 at the Brook Cafe and Bar, along with a recording studio. The Shotfield area of the town centre gained a modern new health centre in 2012, replacing smaller existing facilities on the site. Wallington's parish church is located on Manor Road, and dedicated to the Holy Trinity. It was designed by Habershon and Brock, and completed in 1870. It has been Grade II listed since 1974. The ancient Chapel of Wallington stood on a site to the north of the London Road, behind the brewery in the grounds of the Elm Grove Estate, and was demolished about the year 1791. A deed dated 1480 gives the information that the dedication of the Chapel was to Our Lady of the Moor. The foundations were discovered in 1921, and with them some carved stones which were parts of windows and arches. The remains of the vanished Chapel may be seen in the walls of the Church Hall in Elm Grove and the more recent Church of St. Patrick. The present Church of Holy Trinity was erected in 1866 by Mr Nathaniel Bridges, Lord of the Manor. The Church was consecrated on 28 September 1867, by Bishop Sumner of Winchester. The parish at that time was in the Diocese of Winchester. It was later transferred to Rochester, and when the current Anglican Diocese of Southwark was formed, it was transferred to it. The church was built to resemble the description of the old chapel - after the style of the 14th century. The west window of the south aisle is similar to one in the Church of Little St. Mary's Cambridge, which was erected about 1850. Each window has tracery of a different pattern. The stone used with the flints is Bath stone. The roof and floor are covered with Broseley tiles. The height of the spire is 110 feet. The interior of the church gives an area of 105 feet long by 75 feet broad, and gives sitting accommodation for 650 persons. Since the Parish Church was built it has been adorned with several stained glass windows. Those on the south side are memorials to former worshippers. The central window in the chancel is a memorial to the Rev. John Williams, the first vicar. The north window was presented by the relatives as a memorial to those who fell in World War I, while that in the south side is a gift of the parishioners as a War Memorial. In 1926 the chancel was entirely refurbished, with new Communion Hails - the gift of Mrs Bund, in memory of her husband; a new pulpit - the gift of Mr W. J. Mallinson; a brass eagle lectern - the gift of Mrs Cleverly; marble and alabaster baptismal font - the gift of Mrs Page; oak panelling in the chancel and sanctuary and new oak doors and vestibule at the south entrance - the gifts of members of the Landon family and Miss Roche; and new choir stalls (the cost of which was defrayed by subscriptions) were added to the Church. Parks in the Wallington area include Mellows Park, Beddington Park and the Grange Gardens. The latter two, through which the River Wandle flows, lie in the north-east of the area, on the border with neighbouring Beddington. Beddington Park is nearly 100 acres in size and is maintained by the London Borough of Sutton. It was originally part of the Deer Park attached to Carew Manor, a grand country house built in the Tudor period, which stands to this day. It comprises a large area of open grassland with small clumps of trees, with an area of more formal gardens near the Grange restaurant, as well as a lake and pond. The main lake in the south west of the park was originally a mill pond. There are many paths and a number of ornamental bridges, which cross the stream which feeds the lake: this is part of the River Wandle, and the park is on the Wandle Trail. Part of the park is managed as a wildlife site. Wallington is served by rail, bus and coach connections. Services operate from Wallington to Victoria and London Bridge via West Croydon and to Epsom Downs and Epsom via Sutton and beyond. X26 - to Croydon, Carshalton, Sutton, Kingston, Heathrow. National Express services 025 from London Victoria to Gatwick Airport and Brighton, and 027 from Victoria to Chichester serve Wallington. Neil Ardley, jazz pianist and composer, was born in Wallington. Jeff Beck of the Yardbirds was born in Wallington and lived on Demesne Road. Gary Mason, former British Heavyweight Champion Boxer, who lived in Wallington before his untimely death on Sandy Lane South whilst riding his bicycle, on 6 January 2011. Linsey Dawn McKenzie, English glamour model, pornographic actress and minor celebrity. Phyllis Mudford King (1906-2006), Wimbledon ladies doubles winner 1931. Mervyn Peake lived here for five years when he inherited his father's house in 1953, but sold the house for development when he moved to Chelsea. Eileen Shanahan, Irish poet, lived with her family in Blenheim Gardens. David Walliams (actor) had his primary education at Collingwood Boys' School in Wallington, London, (Surrey), (now Collingwood School). David Weir, Paralympic gold medalist lives on the Roundshaw estate. Elsie Widdowson, dietitian and nutritionist, born in Wallington. David Williams, General Secretary of COHSE from 1983/87, lived in Onslow Gardens with his family, moving briefy to Hendfield Court when he retired and splitting his time between there and Wales, before finally moving to Wales full time. Wallington has a Non-League football club Crescent Rovers F.C. who play at the Wallington Sports & Social Club. The town has four gold post boxes commemorating local resident David Weir's four gold medals at the 2012 Summer Paralympics. All three secondary schools are highly rated grammar schools, with one (Wilson's School) the highest achieving state school - including all state grammars - in Britain. See the London Borough of Sutton article for further details of education in the borough. ^ "Sutton Ward population (Wallington South)". Neighbourhood Statistics. Office for National Statistics. Retrieved 9 October 2016. ^ "Sutton Ward population(Wallington North)". Neighbourhood Statistics. Office for National Statistics. Retrieved 9 October 2016. ^ Morris, J. (1975). Domesday Book Surrey. Philimore & Co. ISBN 0-85033-132-3. ^ "Beddington and Wallington War Memorial". War Memorials Trust. Retrieved 5 July 2014. ^ Historic England. "Church of the Holy Trinity (1357582)". National Heritage List for England. Retrieved 11 May 2017. ^ Cherry, Bridget & Pevsner, Nikolaus. Buildings of England: London 2, South (2002 ed.). Yale University Press. p. 640. ^ a b c d e "History of the Church" (PDF). Holy Trinity Church Wallington. Retrieved 9 May 2017. ^ "Phyllis King: Hard-hitting ladies doubles champion at Wimbledon in 1931". The Times. 2 February 2006. Retrieved 24 October 2007.